Villa Colina Sol is a short walk from the beach securing its sea views from the raised terrace. It's just 5 minutes' drive from Fuengirola with its great choice of shops, bars and restaurants. Both Benalmadena and picturesque Mijas Village are also within driving distance. This 3 bedroom villa is comfortably furnished plus has a large private pool and terrace surrounded by trees adding a degree of privacy. Air conditioning/heating in the bedrooms and lounge, pool heating and WiFi are included. The sea views create the perfect setting for dining and relaxing in the sun. A beach within walking distance too. The spacious private garden includes both terraced and lawned areas on different levels and is ideal for relaxing, alfresco dining and sunbathing around the large pool. There are steps leading down to the lower terrace area with a table and chairs. These terraces are ideal spots to soak up the sun, whilst enjoying the stunning sea views. You'll also have your own brick BBQ for cooking up those tasty treats. Entry into the villa is directly from the off-road parking area, with the front door opening into a small hallway. The spacious, open plan lounge/dining area is well furnished and its large patio doors are simply great for enjoying the sea views and allowing plenty of light to flow into the room. This area is decorated in neutral hues and furnished with seating, a flat screen TV and feature fireplace. To one side is the dining table and chairs for entertaining your party, and it leads to the fully equipped kitchen. The bedrooms consist of 1 double and 2 twin bedrooms, all sharing 2 separate bathrooms. All bedrooms are well furnished and come with fitted wardrobes. This villa has applied for a licence with the Junta de Andalucia and the application number is CTC 2016 16212. The licence number will follow. The villa is located on the outskirts of Fuengirola within walking distance of the beach and some restaurants. What's more, central Fuengirola, Benalmadena and the picturesque village of Mijas are all only a short drive away and offer plenty of shops, bars and restaurants. What's more, there are 2 golf courses nearby. So, all in all, there are plenty of opportunities to make the most of your Spanish villa holiday. There are markets in both Fuengirola and Benalmadena every Tuesday and Friday. The local street markets are held in the mornings and offer an endless selection of local goods together with modern clothing, shoes and handbags, plus other fashion and fun items, all mingled in amongst the fruit and vegetable stalls. For shopping centres, there are several in and around Fuengirola, along the ring road to the town and further afield in the centre of Malaga City. Within the towns of both Mijas and Fuengirola you have streets full of smaller shops, offering a more individual style of fashion and designs for all pockets. Benalmadena has a range of shops too. Aside from the restaurants within walking distance, Villa Colina Sol is only a short drive from the buzzing centre of Fuengirola, with an excellent array of restaurants and bars. There's everything ranging from Spanish tapas to various international cuisine. Why not lunch by the marina or along the quaint cobbled back streets? Or, there's Benalmadena Promenade just 6 miles away, with vast options for wining and dining. For a more authentic taste of Spain, Benalmadena Village is certainly worth a visit - it's ideal for a laid-back dinner in the main square. The nearest beach is just 765 yards away, whilst the sands in both central Fuengirola and Benalmadena are within easy reach by car. Fuengirola offers an incredible 4 miles of beachfront with an adjoining promenade along most of this. There's also the quieter Carvajal Beach, just as you are leaving town in the direction of Torremolinos. Fuengirola has plenty of facilities for the visitor including water sports, the Bioparc Zoo, Parque Acuatico Waterpark or even the historic castle. Alternatively, towards Benalmadena is a Sealife Centre, the Dolphinarium in Paloma Park, Tivoli World, or the cable car in Arroyo de la Miel. There is a local train service which runs from Fuengirola into the centre of Malaga. You could spend a day browsing the shops or even the historical sites and Picasso Museum. The picturesque villages of Mijas and Benalmadena Pueblo are a short drive away. Their narrow streets, whitewashed houses, wonderful panoramic views and historical interest will give you a true taste of Spanish life. There are several bars, restaurants and small shops in both villages. Alternatively, why not take a drive down to the rock of Gibraltar for a day out? There are 2 splendid local golf courses at nearby Miraflores and Torrequebrada. There's also tennis courts, jet-skiing and scuba diving close at hand. Villa Colina Sol is not available to book for season as it is sold out. 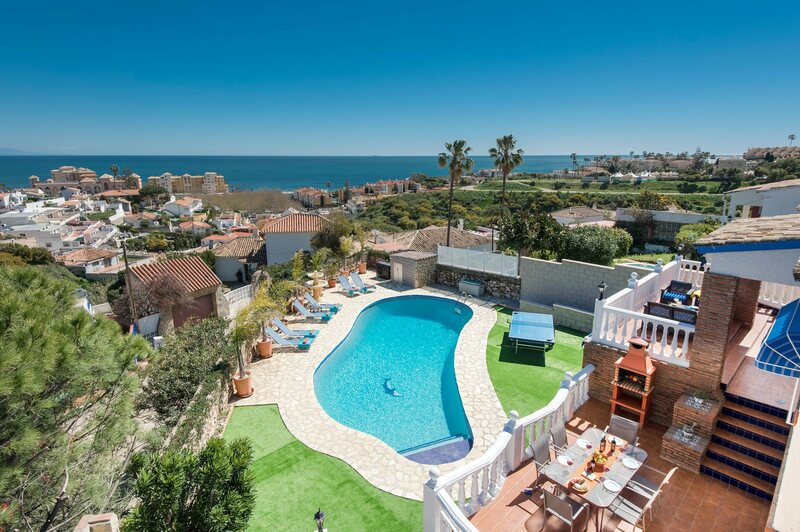 Take a look here at the Costa del Sol villas that are currently on sale. Dolphins are frequently seen off the Costa del Sol and nothing can beat watching these endearing creatures dancing and playing alongside the boats as they live peacefully and reasonably safely in their own natural habitat. This villa is probably the best we have stayed in over the last 6 years! Everything about it was perfect!